Looking to have a bite before a show at the Mayfair, The Belmont popped into my mind as both a convenient location and a place that my wife and I had been wanting to try out. After a brisk jaunt down Bank Street thanks to the dependably-undependable OC Transpo during rush hour, we tucked into the restaurant for our early dinner. 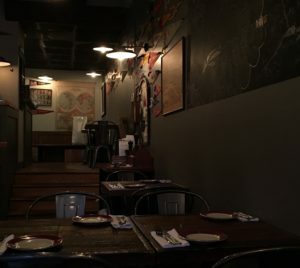 It’s a small space, with several tables and the bar on the main level, and a few more seats up a small set of stairs that run by the kitchen. The décor is fun and funky, with various old and new pennants on the walls, as well as some old maps. It’s like your laid-back uncle’s place, but with more upper-middle class people hanging out. We were seen to quickly and I ordered the Belmont Sam Sour ($12), while my wife got a glass of their Malbec ($12). I was happy to see a Nova Scotian wine – Benjamin Bridge Tidal Bay – make the cut for their lean wine list. The Sam Sour was a very good take on a whiskey sour, with the honey and cinnamon adding depth of flavour to this dangerously easy to drink cocktail. 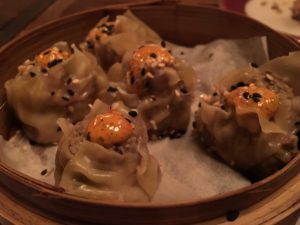 The menu is compact, at 8ish bar snacks and a dozen larger-sized sharing plates, but we were able to pick out a few enticing dishes with ease. 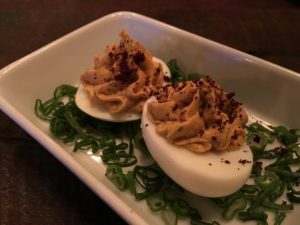 Deviled eggs ($2) seem to be making a deserved comeback in the restaurant scene; we grabbed one of those, as well as an order of the pork and shiitake dumplings ($14), the endive salad ($15), and the half order of Cornish hen ($24). Unsurprisingly, the deviled egg came out in no time. Loaded up for richness, the egg was perfectly cooked, and served on a bed of green onions. 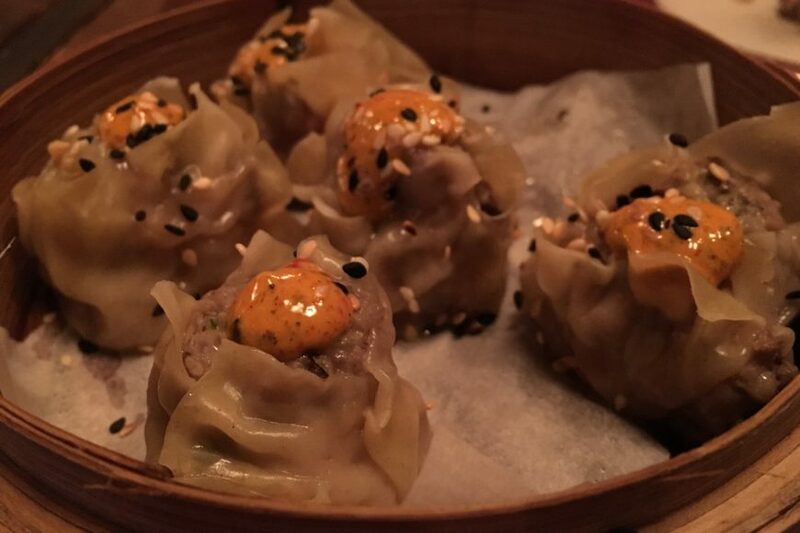 The dumplings followed soon afterward; $14 for six small, shiu mai-style dumplings is definitely high, but these were totally worth it. Thin, pliant wrappers gave way to super tender and moist pork, and the dollop of vibrantly orange togarashi mayo on top gave a little hit of spice. While not as noteworthy as the dumplings (but when are salads? 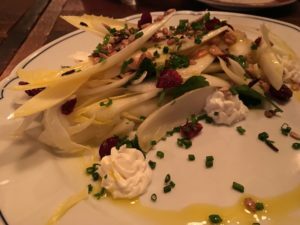 ), the endive salad had lots of great flavours and textures, and provided an acidic counterpoint to our otherwise quite rich meal. Earlier in the evening, our waiter had made the impressive deduction that we were going to a show at the Mayfair, which we had confirmed with impressed laughs. It was at this point in the meal that he checked in to see if we wanted our bill so that we would be able to make a quick exit, which was a great follow-up to an astute observation. We hurriedly dug into our tasty mini-chicken. Plated on top of a pile of baby potatoes roasted in bacon fat, roasted Brussels sprouts and crème fraiche, this dish had all the make-up of a good main – and was equally well executed. The Cornish hen also came with a small cup of Belmont’s take on Swiss Chalet’s dipping sauce, albeit with blessedly less salt. The sauce compared well to the original, and was a big win with my Chalet-sauce-loving wife. 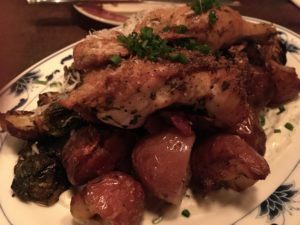 The Belmont is a chill spot to have some very tasty bites, and the service is spot-on with friendliness and quality. PS. We ended up making the movie midway through the trailers.